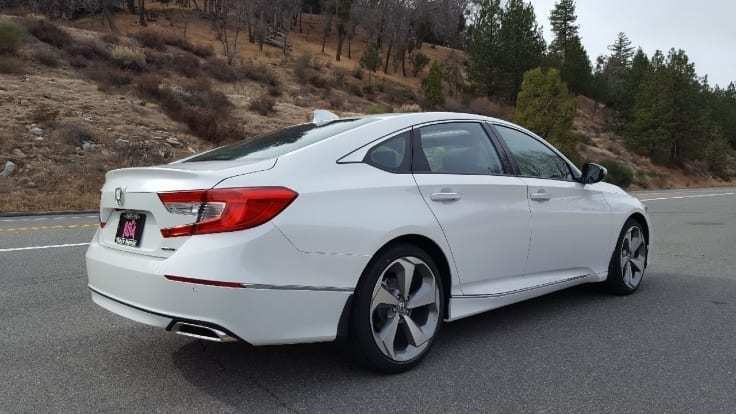 Honda nailed the styling of its completely redesigned Accord for 2018.
iDriveSoCal contributor, Clinton Quan (aka The Professor), picked up a Touring Edition from our friends at Rock Honda in Fontana for a day-long test drive. Hear “The Professor’s” analysis of his test drive through the foothills of the Inland Empire in this iDriveSoCal Podcast. Clinton Quan: I got to drive the 2018 Honda Accord Touring, which is the top line trim from Rock Honda. Everything is brand new, all new design inside out. It’s got that fastback slope roof design which you see in a lot of cars now. And it really has a premium feel to it which I think a lot of people will really appreciate. It almost looks like a luxury car. I really got to really push the car and see how well it could handle. There’s a number of curves up on Highway 138. And this car, it handles really well, especially for a midsize sedan. Tom Smith: Welcome to iDriveSoCal, the podcast all about mobility in the automotive capital of the United States – Southern California. I’m Tom Smith and joining me in this episode is our good friend, The Professor, Clinton Quan. Say hey to everyone, Clinton. Clinton Quan: Hi, everyone. And, hi, Tom. It’s great to be back. Tom Smith: Thanks for coming back. Clinton is a buddy of mine. He’s a transportation engineer, one of the biggest car guys I know. He keeps his finger on the pulse of everything coming out of every manufacturer, whether that is a foreign, domestic, luxury, even exotics. Clinton is also an iDriveSoCal contributor. This is his second go around with us. And we very much appreciate his expertise and joining us today. So the 2018 Honda Accord from Rock Honda is the topic du jour, Clinton gave that a test drive, and he’s going to tell us all about it. Clinton Quan: Yeah, I got to drive the 2018 Honda Accord Touring, which is the top line trim from Rock Honda. There are five different trims for the Honda Accord. The base trim is the LX. Then you have the Sport trim which has the really nice 19-inch wheels, the mid-level trim the EX, the EX-L, which is the same thing but you’re getting leather, and then the top of the line trim, the Touring, which is the one I drove. And the Touring is available in both a 1.5 turbo charge engine or a 2.0-liter turbocharged engine as with most of the trims except for the LX. The one I drove has the 192 horsepower engine. It also has 192 lb-ft of torque with the 1.5-liter. Tom Smith: The 1.5 turbo is 192/192? Clinton Quan: Correct. So that’s easy to remember. Tom Smith: And those two engines are available on all the models? Clinton Quan: It’s available on all the trims except for the base trim, which is the LX trim, which would only be available with the 1.5 turbo. Tom Smith: Gotcha. And before we turned the mics on, you were talking about 19-inch wheels and that being a significant aesthetic option or an aesthetic additive on this year’s Touring. Do I remember that right? Clinton Quan: Yes, I believe the previous generation actually had smaller wheels and it was only the sport model that came standard with those big 19-inch rims. And that is actually a very popular model because it looks great with those larger wheels, and you’re getting a lot of car for the money. It starts around… I know the previous trim started around $23,000. I believe this new one starts around $24,000, $25,000. Tom Smith: So the 19-inch wheels are available on the sport as well as the Touring? Tom Smith: Okay, and we were talking a little bit more about the trim options in the Honda lineup. Tell us a little bit more about that. Clinton Quan: Well, the great thing about Honda, you have these different trims and pretty much that’s the car you’re going to get. With a lot of other manufacturers, they have all these different trims, but on top of that, there’s options and packages so that can really start to add up in terms of the costs above the base price of that trim. With the Honda, there’s not really a whole lot of other options on top of that. So you’re going to get what you see. Tom Smith: Nice. And that’s…not to you’re going to shop anywhere other than Rock Honda, of course, but should you be doing so, always go to our friends at Rock Honda, and they’ll hook you up with the best deal. Make sure you tell them that iDriveSoCal sent you. But nevertheless, one of the nice things about those specific trim levels is that, hey, I’m looking at an LX here. I know that that’s going to have the same options everywhere and that’s just something that Honda does. Clinton Quan: Yeah. There’s different packages and pretty much what you see for that package is what you’re going to get. There’s not going to be a whole lot of other options or packages or anything on top of that. So you’re going to get that car the way it’s specced out. Tom Smith: Back to what you test drove. Again, it was the Touring, which is the top of the line. Clinton Quan: Yeah, that’s their top of the line trim. Tom Smith: But then it was not quite the biggest motor that they had. Clinton Quan: Yeah, there’s a bigger motor which is the 2.0-liter turbo and that replaced the previous generation’s V6. This one produces 252 horsepower. So it’s a little down on horsepower, but it’s up on torque. It’s got 273 lb-ft of torque. Tom Smith: Okay. And we learned in our previous podcast with you that that torque means that it’s going to get you to speed, the speed that you want to be at, quicker. Clinton Quan: A torque is what gives you the acceleration. Horsepower is what’s going to give you the top speed. Tom Smith: If you listened to the first podcast that we did with Clinton, we talked about the differences between a refresh and a completely new model. And in this case, for the 2018 Honda Accord from Rock Honda, it is a completely new model, right? Clinton Quan: This is a completely brand new model. Everything is brand new, all new design inside out, brand new engines both the one 1.5 liter turbo and the more powerful 2.5-liter turbo, which replaced the previous generation’s V6, all new interior, new technologies. So this is an all-new vehicle. Tom Smith: And it’s a beautiful car. Clinton Quan: It is a beautiful car. It’s got that fastback slope roof design which you see in a lot of cars now similar to say something like an Audi A7. And it really has a premium feel to it which I think a lot of people will really appreciate. It almost looks like a luxury car. And quite honestly, if I had a choice, I would take the Honda Accord over the Acura TLX. It’s really that good of a car. And the interior, it really has that European inspired styling. From the moment you sit in it, if you look at the navigation screen, it’s very similar to an Audi or a BMW. It sits right above the center stack. They’ve also gone with a three-spoke steering wheel. They’re going back to the traditional speedometer and tachometer completely circular in the center. It just has a much sportier feel, a more premium feel as well. The difference with the four-cylinder and the six-cylinder is the four-cylinder turbo you have the traditional shifter and the upgraded engine, the bigger 2.0-liter turbo engine. 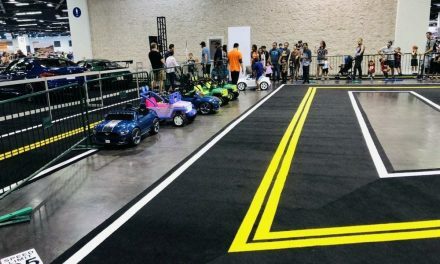 That one has push buttons for the park, reverse, neutral, and drive. Tom Smith: So it’s just in the center console kinda area there? Clinton Quan: Yeah, it’s in the center console as opposed to a shifter. You’ve got buttons like the Aston Martins or Lincoln is doing the same thing now in their vehicles. Clinton Quan: Yeah, and now Acura has it in their vehicles as well. Tom Smith: So it’s a completely new model. It still looks like a Honda Accord. But to me, it looks a lot bigger both longer and wider. But I think we were talking about that and that’s my eyes deceiving me, right? It’s not actually both bigger in width and length? Clinton Quan: I believe it is a little bit wider. Longer, it’s longer maybe about an inch or so. It’s not a lot longer. It’s a little bit longer. Clinton Quan: I think it’s more the styling, yeah, especially with that sloped fastback design. It certainly makes it look like it’s a longer car. Tom Smith: All right. And tell us about your drive. Clinton Quan: Well, I got to take a test drive out on scenic Highway 138, and this was where I really got to really push the car and see how well it could handle. There’s a number of curves up on Highway 138. And this car, it handles really well, especially for a midsize sedan. And it definitely had adequate power with the 1.5-liter turbo engine. I was really impressed with the way the car turns and maneuver. Tom Smith: So sporty car, good handling good acceleration. The price point for the vehicle that you drove, Clinton, what is that sticker price? Clinton Quan: The sticker price on the 1.5 Touring it was around $34,000. Tom Smith: $34,000. And then the only additional upgrade you can do from what you drove is the bigger engine, right? Clinton Quan: The bigger engine which is the 2.0-liter turbocharged engine. Tom Smith: What does that come in sticker price? Clinton Quan: I believe that’s probably another $1,500 or $2,000. Tom Smith: Okay, so we’re looking at $36,000-ish, right? And that is for a lot of car. Clinton Quan: Yeah, you’re getting a lot of car now. 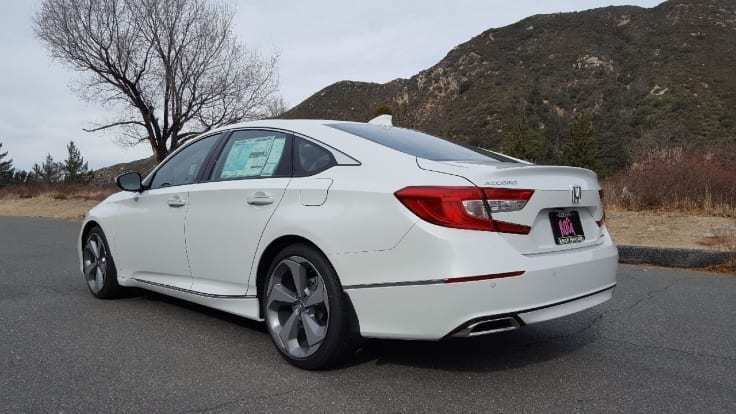 In fact, a lot of these mid-sized sedans, especially this Honda Accord, you’re getting safety features that you normally wouldn’t be able to see, and luxury features as well, such as in an Acura or Infiniti or a German luxury automobile. Tom Smith: That’s another podcast that I recently did with the general manager of Rock Honda, David Latif. We talked about the difference between leasing and buying. And you and I have had many of those conversations as well, and I’ve become a leaser. I don’t foresee buying any more. Because of the technology, I always want the latest greatest technology at my fingertips and underneath my feet as well as safety. And I recently became a dad and the safety element made its way to the top of my priority list. So I don’t know. When I think about, in my conversation with David Latif, he said, “Yeah, absolutely.” They’re leasing way more these days and you can just get so much more car. And then when you’re talking about the Honda, overall, it’s entire line, but especially the Accord as well, you’re getting a ton of car for a very, very, very, very reasonable price comparatively speaking. So at 36-ish, and don’t forget, everybody, go to Rock Honda. They’re going to give you a smoking deal on anything and everything that you need from them. But at 36-ish for the top of the line, and you said there are five trim levels? Clinton Quan: There are five-term levels. Tom Smith: Do you know about what each trim level down is going to be or where the base model is going to come from a sticker price point? Clinton Quan: The base model should start around $23,000 for the LX. Then it’s probably another $2,000 for each trim level as you move up. So maybe $25,000, $27,000. Tom Smith: Right around there. Clinton Quan: $30,000, yeah, somewhere around $2,000 to $3,000 price difference between each trim level. Tom Smith: And when you think about who this car is for, it’s almost not a perspective who it’s for. It’s almost for who it’s not for, right? Clinton Quan: Yeah, the midsize sedan it’s really a car that’s really for everyone and that’s why it’s one of the top-selling segments in the automotive industry whether you’re single or whether you have a family or you have a spouse. It’s really a car for everyone, and the mid-size sedan is also known as a family sedan. So it’s definitely made for families one or two kids preferably. Tom Smith: But when we were picking the car up, I could very easily see, you know, an executive driving that car around and bringing associates or clients, and pulling up to a valet, and feeling proud to do so because it is a very good looking automobile. Clinton Quan: Definitely. It has that luxury look to it both on the outside and on the inside. And when you sit in it, you’ll notice it. It’s got the Head-Up Display. It’s got power seats, ventilated seats in the front. It even has heated seats in the back as well. Tom Smith: Wow. And we’re like we’re still talking Honda. We’re not talking Acura. I can understand why you mentioned that you might take this over the Acura. Clinton Quan: Yeah. We’re talking Honda. Tom Smith: Now ventilated seats, to me, my wife and I we are the heated and ventilated seat couple because hers…no matter…we’re in Southern California in the middle of summer, she’ll have her heated seat on. But we’re in Southern California the middle of winter– it does get cold here— I have my ventilated seat up and so heat and ventilation on the front seats is a big one for us. Clinton Quan: And they’re three-way ventilated and three-way heated seats too. Tom Smith: I might have to take a hard look at this car next time my next lease comes up. Clinton Quan: Yeah, I think a lot of people will be surprised what a drastic improvement this car is, the new generation. Tom Smith: And heated rear seats as well. Clinton Quan: And heated rear seats. Tom Smith: That is nice. Okay, so anything we missed about the Honda Accord? Tom Smith: Honda Sensing, just real quick, the Honda Sensing, this comes with all of the Accords? Clinton Quan: Yeah, it’s standard on all the Accords whether you get a base LX or you get the top of the line Honda Accord Touring. Tom Smith: And this is their safety package that comes in everything. Clinton Quan: In all the Honda Accords. Tom Smith: And it’s called Honda Sensing. And now that we have that setup, go ahead with what comes in the Honda Sensing package. Clinton Quan: There’s a number of safety features. One of them is collision mitigation braking. Another is road departure mitigation. And there’s also lane keep assist. So some of those are the major features that are part of the Honda Sensing package. Tom Smith: All right now the other thing that you mentioned was the head up display. Is that on all models or is that just on the top tier models? Clinton Quan: I believe that’s just on the top tier models. In fact, actually, that’s only on the Touring model. Tom Smith: Head up display is only on the Touring. Clinton Quan: Actually, yeah, that’s actually only on that top, very top of the line trim, the Touring. Tom Smith: Okay, and describe to me what the head up display is going to be because I remember when head-up…was it the early 90s or mid-90s when the first head up displays came out? They kind of came and went like the technology wasn’t quite right. You remember what I’m talking about? Clinton Quan: I don’t remember which car came out with that first, but I remember. Tom Smith: But it came and went, but now head up display is making a comeback. Clinton Quan: It’s definitely making a comeback. Tom Smith: They’ve got it right now. Clinton Quan: Yeah. You see it in a lot of more premium cars, luxury cars, and, basically, what it is is it projects an image onto the windshield so the driver doesn’t have to look down at the dashboard. It’s supposed to make it safer so you don’t have to tilt your head all the way down. And usually it will project the speed of the vehicle and there might be some other information. But basically, it’s the speed of the vehicle. Tom Smith: And you could see it during the daylight, right? Clinton Quan: Yes, you can see it during daylight. Tom Smith: What else? Anything else you want to note about the 2018 Honda Accord from Rock Honda? Clinton Quan: The other thing I really liked was the wireless charging feature. Tom Smith: Oh, that was cool, wasn’t it? Clinton Quan: That was very cool. And I believe that’s only in the Touring trim as well. Tom Smith: And the way that works, because I saw the car being delivered to Clinton, the way that works is you literally just take your phone out of your pocket and put it in the little compartment in the center console that’s kind of slightly underneath the dash in that general area. Clinton Quan: Correct. It’s between the center stack and the center console, yes. Tom Smith: And you just plop the phone there and, boom, it’s charging, right? Clinton Quan: I think that’s a great feature of the new Accord as well. Tom Smith: Top three things on this vehicle? Clinton Quan: Top three things: I love the new exterior design but my favorite definitely the new interior. I love the three spokes steering wheel, the new dashboard, the gauges. I really like how they’ve taken away the two displays which were in the previous Accord and now they’ve gone with a single display for the navigation screen and then all the great safety features that come in the Accord whether you’re getting the base trim or the top line trim. Tom Smith: Design, display, and safety, top three things? Clinton Quan: Exterior, interior design, and safety features. Tom Smith: All right, excellent. 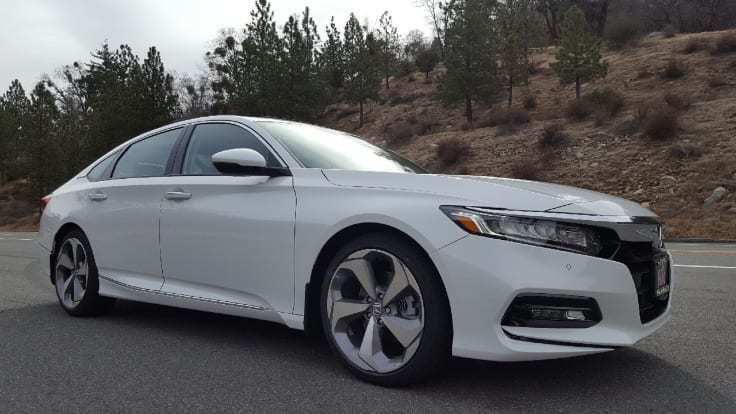 Okay, so that was the 2018 Honda Accord from Rock Honda as run down by our contributor, The Professor, Mr. Clinton Quan. 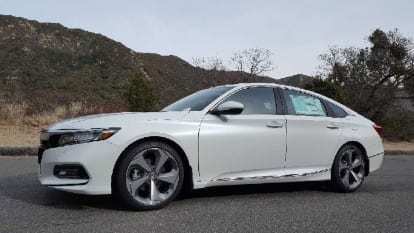 Clinton, thank you again for contributing to the iDriveSoCal podcast and for reviewing the 2018 Accord from Rock Honda. Reach out to Rock Honda for any and all of your Honda needs. They’ll be more than happy to help you. We thank Rock Honda for their partnership. For iDriveSoCal, I’m Tom Smith. Thanks for listening. Until next time.